Snowy Owls once were birds of total mystery, appearing in the U.S. now and again, sometimes blessing us with many birds, very time eventually disappearing to the north, journeys uncharted and unknown. I’ve written before about Project Snowstorm. This is an ongoing research effort that fits owls with tiny tracking devices that records bird movements, when and where. An email report I received a week ago that detailed the travels of two of these birds. They are named for the places where they were captured as participants in this research. The tracking technology they wear on their backs collects and stores satellite data points for download at cell phone towers. A bird coming south from its Arctic nesting grounds, putting itself in cell-phone range, can take months. The owls known as Wells and Island Beach recently flew far enough south to be in contact. Together, they downloaded 12,000 GPS points. Wells was captured near Wells, Maine. This bird is an adult female. She spent the summer of 2017 in northern Quebec, and is assumed to have nested there. 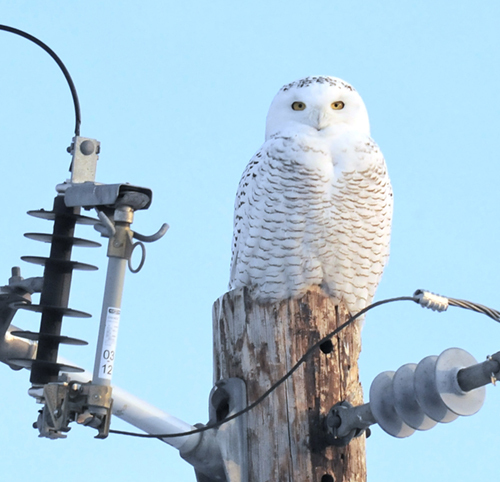 That is a frequent nesting area for Snowy Owls. She spent the winter of 2017-18 on the outskirts of Quebec City. In April 2018 she was on the move again, heading for Hudson Bay, a flight of 420 miles. Data shows that she seems to have drifted on pack ice for a while, then flying up the western side of the bay through Nunavut and into the Arctic Archipelago. Researchers believe she did not nest that spring. In late September 2018 she began a trip that ended on the north shore of St. Lawrence River. This owl traveled 5,654 miles in total. That ranks with some neo-tropical migrants in distance traveled in one year. The number of owls being tracked in this program is small. The birds first must be found, then trapped, finally equipped with expensive data collectors. They and the equipment must survive, and the birds must, in essence, find a phone and call home. Stay tuned. In the meantime, see for yourself at Project SNOWstorm.